A friend and I were talking about the process of art making, and how much practice is needed to create art –and especially to get a piece that meets one’s artistic expectations. We were also discussing how a desire for perfection can sometimes keep you from creating at all. That’s one of the reasons I like to participate in drawing challenges like Drawlloween— and make it public– it gives me a little extra kick to commit to my work. Whether I like the results or not, the work must commence. 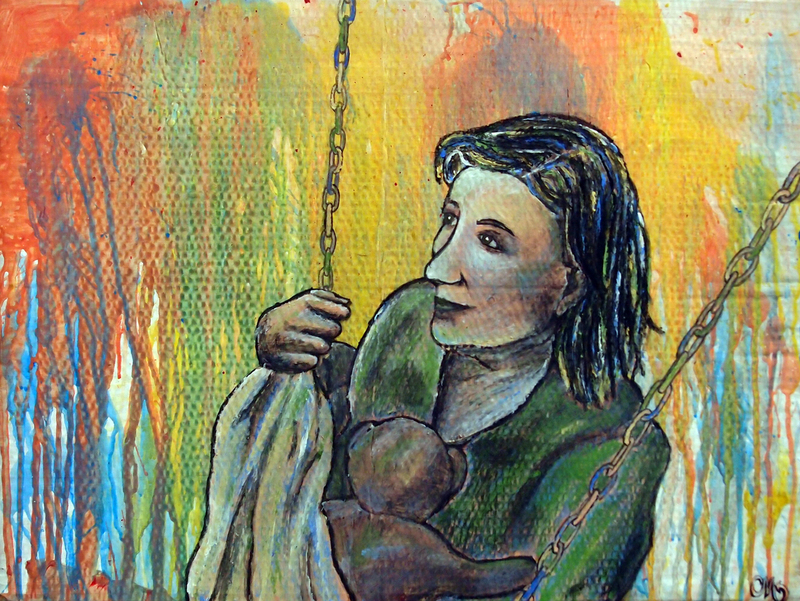 For today’s prompt, Circus Sunday, I dug out an old painting that I had abandoned a few years ago because I just didn’t like how it was turning out. Inspired by the conversation with my friend, and hoping the circus image would be work for Drawlloween, I tackled the old painting, adding more darks and color, not worrying about the previous expectations I’d had for the piece. It didn’t take me very long to give the flat image a little more life. There are still things I would do differently, but it’s not sitting neglected in a drawer. And, while the image isn’t eerie, or even Halloween-y, I figure there’s nothing more scary than confronting your creative demons, so here is my Circus Sunday. 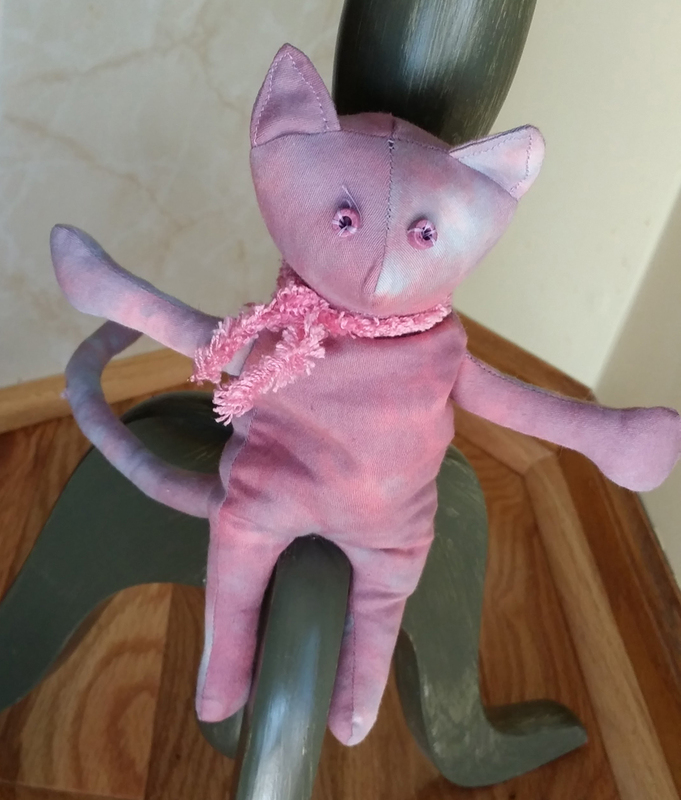 A few years ago, I constructed a prototype toy cat using scraps of hand-dyed fabric and some beans for stuffing. The resulting creature, let’s call him Stuffed Cat One, was entertaining, but not quite what I was trying to achieve. 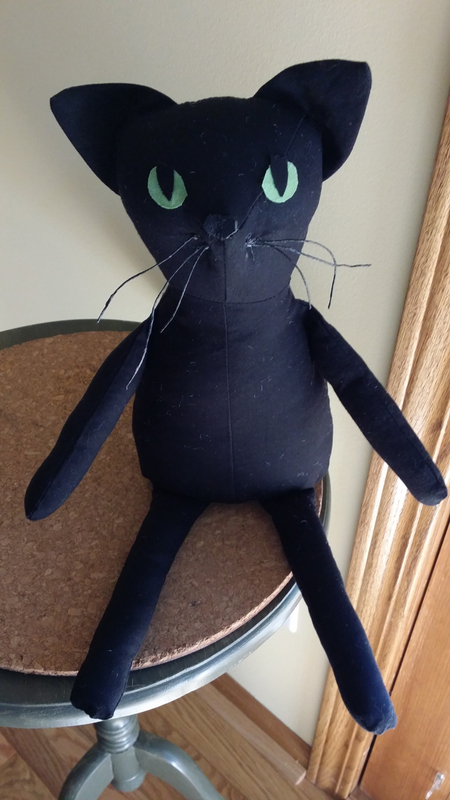 I learned a lot at that time, like, I don’t like working that small, the arms should be longer, the head isn’t dimensional enough, it needs a puss nose and whiskers. It’s kind of a long list. For whatever reason, I woke up this morning, three years later, determined to take another go. Here’s the original! Stuffed Cat One. 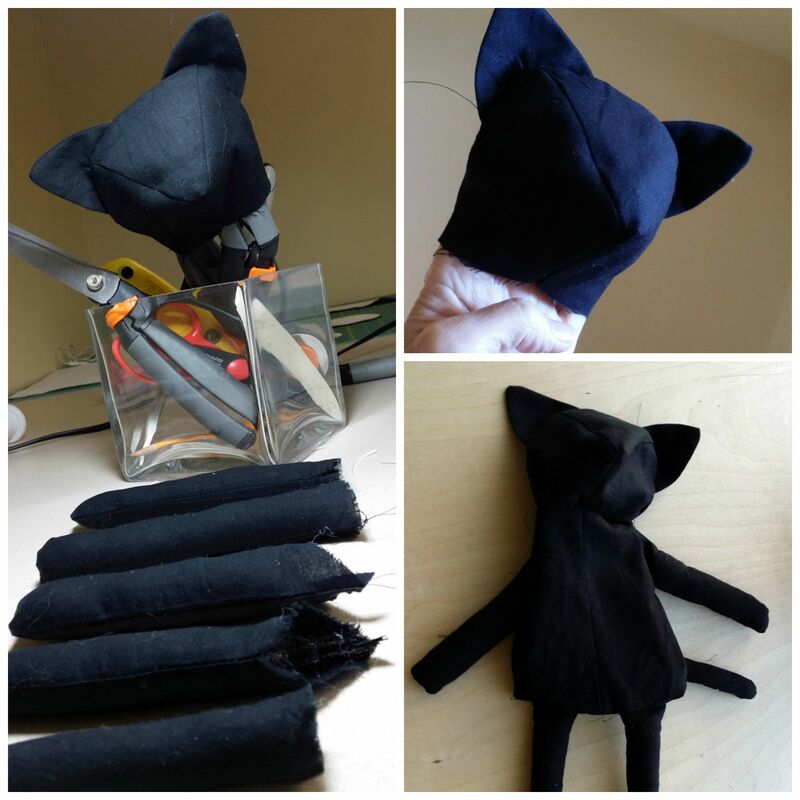 Stuffed Cat Two, assembled from black cotton, is fresh off the design table. It was not easy going. First of all, black is impossible! A lint collector of the first degree and hard to see details, I struggled with keeping it clean and concise. Heads, legs, arms, and a tail. Plus, the unstuffed body of Cat Two. Second, there are some proportions I would change. The distance from the nose to the neck seam is too long for a cat. The narrow arms and legs next to the puffy torso make Stuffed Cat Two look like a cousin to Piglet from the Hundred Acre Wood. The size and placement of the ears may be adding to this problem. The eyes give him that Toothless look from How to Train Your Dragon. However, these eyes are an improvement over the first attempt where I sewed on amber-colored jewels that made Stuffed Cat Two look like Super-Freako Sparkle Kitty. The finished prototype. He has whisker issues, but he seems friendly. Don’t get me wrong. Prototypes are important. I didn’t wake up thinking I was going to make Two, the Amazing Forever Cat. Besides, frustration is instructive. I learned that I like working this size better. I think the overall shape of the nose is improved over Stuffed Cat One. And, during construction, I figured out some shortcuts that would help if I wanted to make more than one at a time. Stuffed Cat One and Stuffed Cat Two, side by side, for comparison. 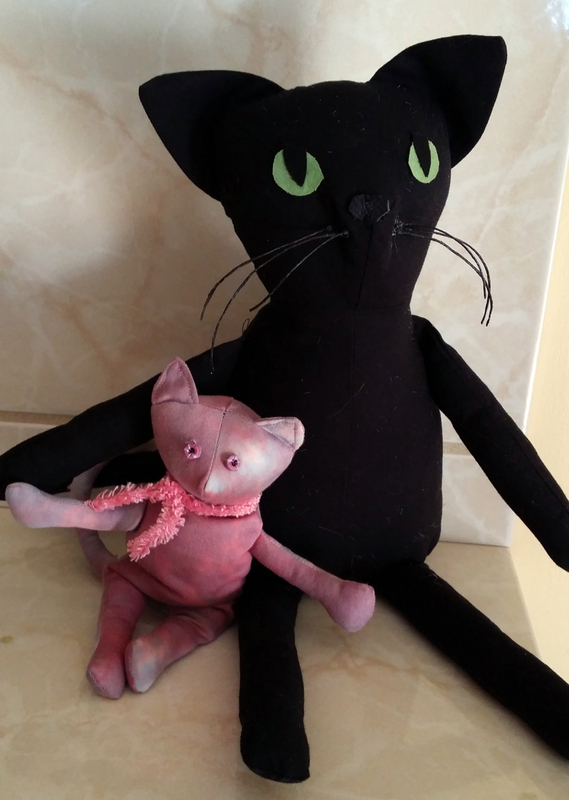 It is unclear whether or not I will now, or sometime in the future, create Stuffed Cat Three. All of my observations will guide me should I decide to make adjustments and try again. I just have this romantic notion of a herd of Stuffed Cat minions, all fun and funky, looking down at me from a decorative shelf. No matter what I decide, I’m sure you’ll hear about it one way or another. 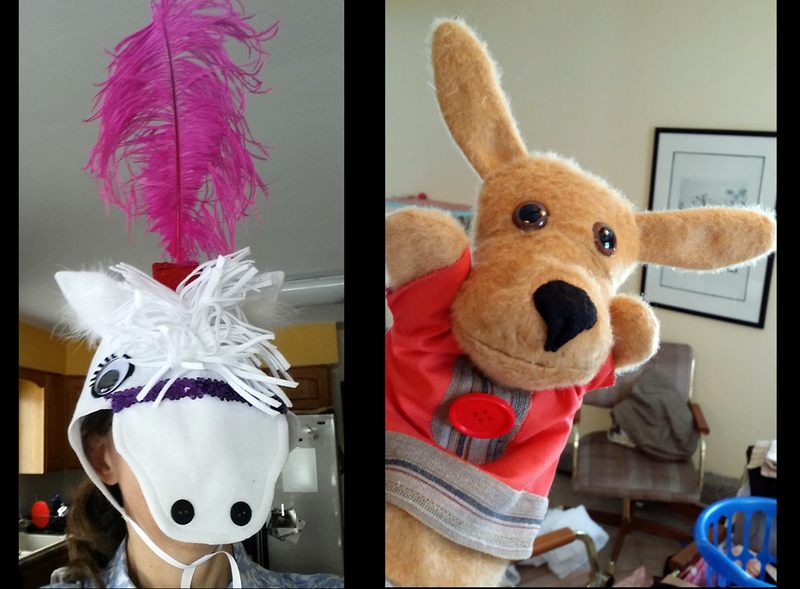 I’ve been working on costumes for a local production of The Wizard of Oz. First dress rehearsal is this Monday, so I’ve been super busy creating munchkins, flying monkeys, and the rest of the characters. 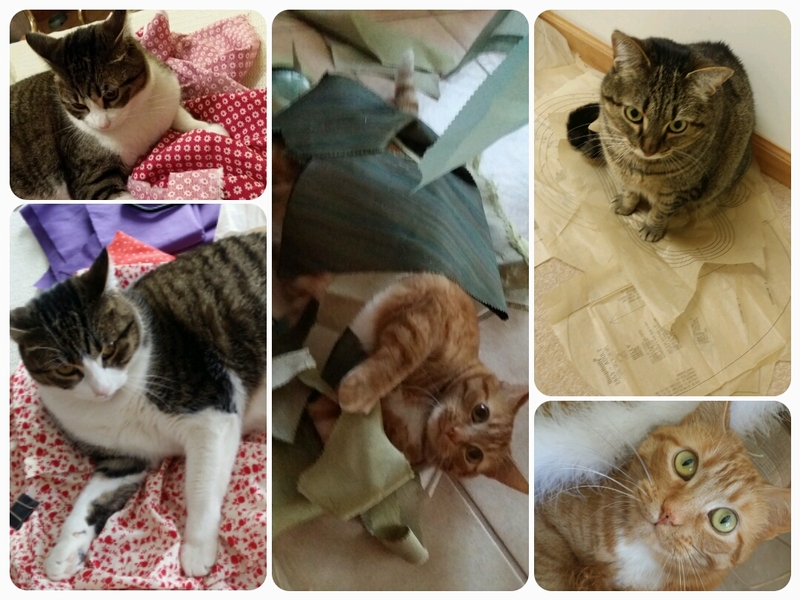 Here are some snapshots of my faithful assistants “helping” me with the costumes. Vera does quality control by laying on all of the fabrics, testing them for comfort and durability. Lucy goes through the scraps and trims, looking for useful bits of decoration before the broom takes away the excess. And Miss Bean is the project manager. She oversees the operation, keeping the work orderly, ensuring that the pattern pieces don’t get disheveled by anyone but her. Thanks for checking in! Now, I’m off to see the wizard! One of the circus horse heads, and the more or less successful, Baby Kangaroo. Do you remember a few posts ago when I mentioned that there are times when a creative project might benefit from adrenaline-induced mania, like on Project Runway? Well, I am in one of those zones this week! Tomorrow is costume parade/first dress for Seussical, Jr., the show I am costuming for Platte River Elementary. Every character now has a completed main garment, so I’m doing things like gluing matching feathers on shoes and making animal hats. I just finished the Baby Kangaroo puppet. It didn’t turn out how I envisioned, but I’m happy with the results anyway. That’s what happens when you get down to the wire. I used to work for a costume designer who would say, “Done is wonderful,” when we’d get close to a deadline. That’s me right now. Done is wonderful. As you approach your own creative endeavors this week, find something that needs finishing! Deadline or no, your projects deserve to be fully realized, so let go of expectations and just go for it. 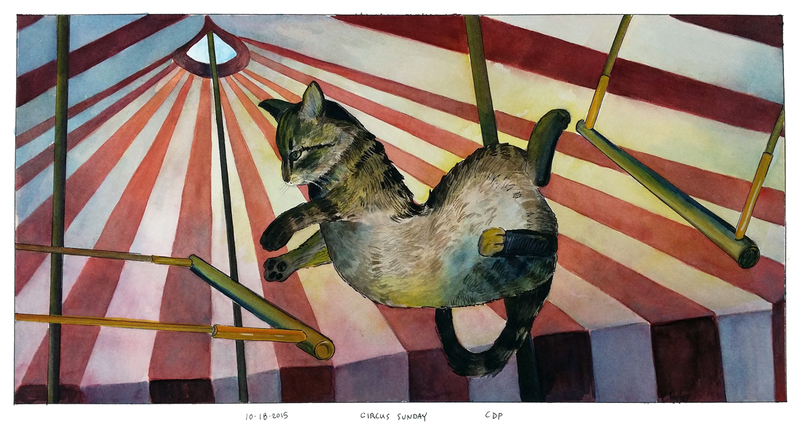 Artwork by Clayton McCracken, one of my former students (2013.) Clayton is currently attending Savannah College of Art and Design. There is a ton of evidence to support the idea that play is essential to invention and creativity. In his TED talk, Tales of Creativity and Play, Tim Brown, CEO of IDEO an “innovation and design” firm talks about the importance of play in the design process, which includes experimentation with materials, and role-playing to understand behaviors. Super-interesting stuff! Watch it here. Many top firms now include play as a component of the workplace. From Google’s famous indoor slide, to Apple’s volleyball courts, employees are encouraged to play at work and to work at play. Companies are realizing that to have innovative output, there must be a culture of trust, encouragement, and collaboration that is enhanced through shared discovery. There’s even a National Institute for Play, which supports research about what play can teach us at any age. One of the happiest times in my life was when I was in my final year of working on my MFA. I was preparing my thesis exhibition and teaching 6th grade art part time in a rural, public school. I taught the first three periods of the day, finished around 11 a.m., and then made the 30-minute drive back to my studio in the city. I had just completed two grueling, serious, emotional years of study where the competition for shows and attention was cut-throat. Getting the job with these kids saved my soul because they reminded me that art is FUN! I watched the students learn by taking risks, being goofy, not necessarily succeeding, but trying anyway, and being proud of their efforts. It was refreshing to take that attitude back to my own studio where, frankly, I was so stressed out, that making art was not so much fun. I had become nearly immobilized by critiques and exhibitions and competition and output, that I forgot to play and explore. As a result of my experience with those awesome 12-year olds, I was able to find the vigorous part of my spirit in art making once again. Do you give yourself permission to discover, experiment, and suppose? When you were a kid, what activities were the most fun? How did you investigate your world? How can you imbue your adult life with more silliness, inspiration, and inquiry in order to advance your creative ideas now? Here’s a piece I designed as part of the Crash Course on Creativity. 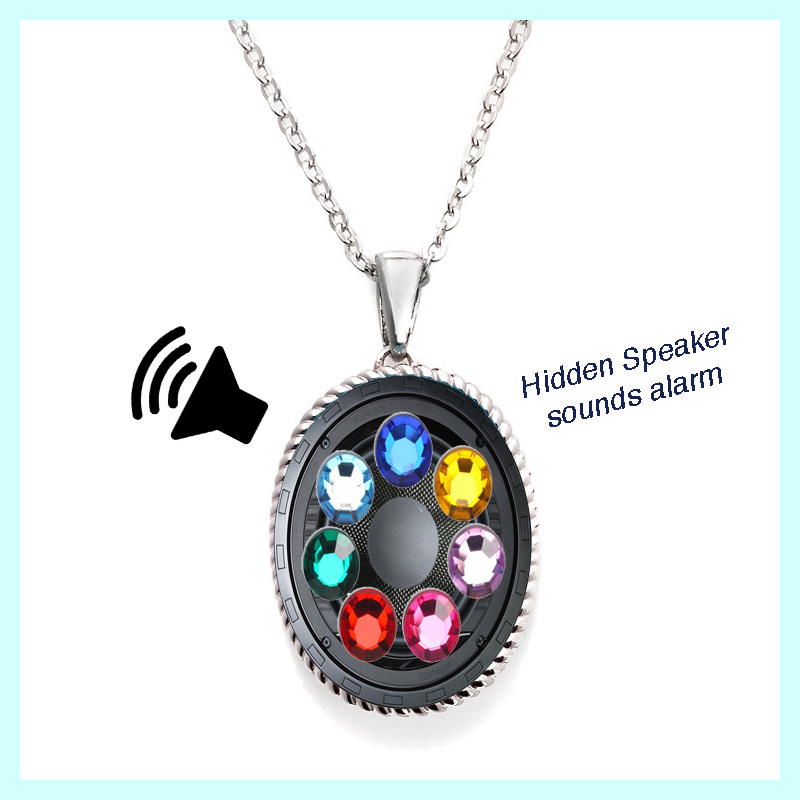 It’s a flashy piece of bling that sounds an alarm when it’s wearer uses incorrect grammar. Juxtaposition asks you to compare things in order to extrapolate a meaning. When trying to develop or push an idea, it’s often worthwhile to force comparisons of things that may be dissimilar. The resulting vibration of oddness can pique the imagination into looking for solutions that may not been evident to you before. This is one of the classic examples of Chindogu. Take Chindogu, the Japanese art of unuseless inventions as an example. By “unuseless” it has to appear as if it would be a great idea, but isn’t really practical. In fact, if you’ve made something truly utilitarian, then, according to the tenets of Chindogu, it’s not a Chindogu. Think of little umbrellas for your shoes, or a motorized work desk so you never have to stop working. I’m not suggesting that everyone go around making absurd or unusable work, but rather, how does the introduction of new or unexpected information enable you to explore the problem in a new way? How can the compare-and-contrast of juxtaposition help you to expand your idea’s usefulness, context, scope, appearance, or unique qualities?